Level control is a very common process requirement for vessels across a wide range of industrial and research applications. The most common level control configuration is an on/off valve triggered by a level sensor. In some industrial systems a flow control valve is configured for level control where the input to the flow control valve is provided by an analog level sensor. Traditional float valves are a common process configuration to provide effective and safe level control for industrial vessels (see figure below and to the right). It uses a mechanical actuator to open and close the valve, so the initial setting must be achieved via mechanical adjustment. The available materials for this type of valve is such that there may be cases where process fluids are incompatible. Depending on the design, the float may be difficult to fit cleanly into the process tank. An alternative method is controlling the level with a flow control valve in a PID loop with a level detector (see figure below). In this case the flow control valve receives feedback from the PID controller through an I/P electronic controller. The PID controller receives input from the level detector in the process tank. This type of configuration is easy to adjust, in that it is electronically controlled, but may be slow to respond to flow surges. Errors in the system can become difficult to troubleshoot with all the components involved in the configuration. The configuration requires acute programming skills to set up properly and maintain. The Equilibar® precision back pressure regulator combined with an electronic pilot pressure regulator is a third design configuration option that can provide precise and consistent level control (see figure below). This simple, elegant design is easy to install and maintain. The signal from the pilot pressure regulator is set up to match the tank level with a 1:1 ratio, making it easy to adjust and hold the desired level without complicated PID loops and level sensor feedback. This design has a small footprint and the electronic pilot controller can be located away from the Equilibar BPR to save space when required. The wetted components are available in multiple combinations for a large range of chemical and temperature compatibilities. The Equilibar BPR responds instantaneously to changes in setpoint and flow to maintain the desired process conditions, making it easy to set up, automate and adjust as needed. Watch the video below for a demonstration of using an Equilibar back pressure regulator to control level of a water column. 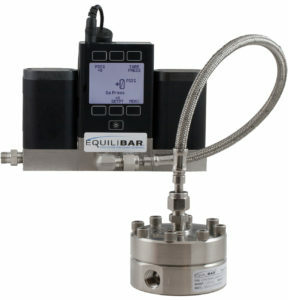 Contact an Equilibar process engineer today for more information about using Equilibar products for level control in your process.